When you are sick of training in the rain & cold, or if you need to do specific training, home trainers can provide the ideal solution. On the face of it, there are just two options with regards to bike training at home: Rollers or Turbo’s. However, there is a wide selection of turbo trainers and rollers available, trainers using a variety of different technologies to provide an effective, realistic workout. Magnetic resistance trainers have a magnetic disc spinning next to a steel flywheel to increase or decrease magnetic resistance. Magnetic trainers offer the option to set your level of resistance, which can be used to replicate flat, climbing or downhill riding. Spinning metal discs with a magnetic field can cause heat build-up over time. Manufacturers combat heat build up by fitting a fan, this can make magnetic trainers a bit noisier than fluid trainers. Magnetic resistance trainers are usually more cost effective and offer a variable resistance work out. With fluid trainers the fan (or impeller) is spinning through a silicone fluid. Fluid trainers tend to be the quietest trainers, the fan is fully enclosed in a watertight (fairly sound proof) casing. Manufacturers tune the viscosity of the liquid to create a realistic power-curve. The viscosity of the fluid can change as the trainer heats up, some manufacturers have introduced a fan to keep the fluid cooler and more stable whilst in operation. Fluid trainers tend to offer a more realistic and smooth ride feel than magnetic. Similar to magnetic trainers, Electromagnetic Trainers use similar technology but in a more modern way. The electromagnetic trainers use electricity and so can be controlled digitally via a head unit which fits to the handlebars. Electromagnetic trainers can also be used to measure power in watts. Several manufacturers incorporate the ability to hook up to computers to provide stimulation for what can otherwise prove a slightly tedious training option. Software can incorporate real ride GPS data so you can recreate outdoor experiences into your home. 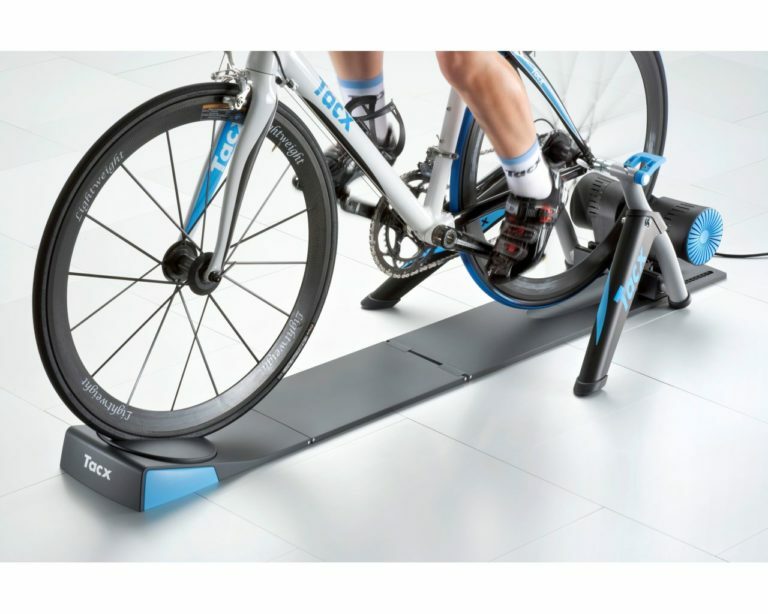 Tacx’s top end trainers are motor turbo trainers. This type of trainer uses a motor as the resistance method – a current carrying coil and a magnetic field provide the resistance. 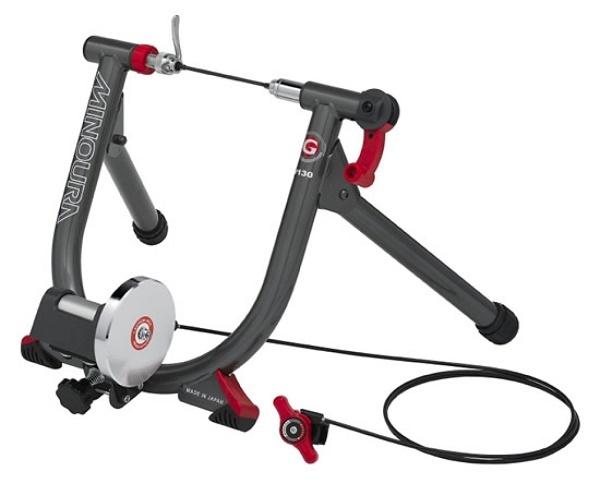 Essentially, motor trainers don’t differ much in terms of feel from Electromagnetic trainers, however motor trainers can apply load in both directions and physically spin your back wheel. 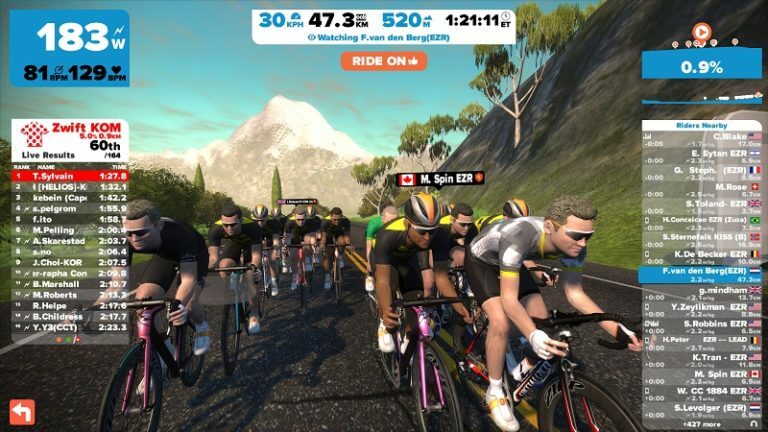 This is great for riding with GPS course via your laptop or on ride simulation programs such as Zwift – the downhills will feel like downhills! A more recent design of trainer is the direct drive trainer. Several manufacturers produce Direct Drive trainers, you will need to attach a cassette to the trainer. The bike is attached with the rear wheel removed and so this eliminates the issues of tyre wear and wheel slippage under heavy load. Direct drive trainers use either magnetic, fan or fluid resistance. More advanced ones like the Elite Muin Fluid trainer (below) are ready to hook up to your PC, Mac or Android device with a transmitter dongle. Last but not least. Rollers. Rollers can take a little bit of time to master, but can really help pedalling smoothness and core muscle strength. 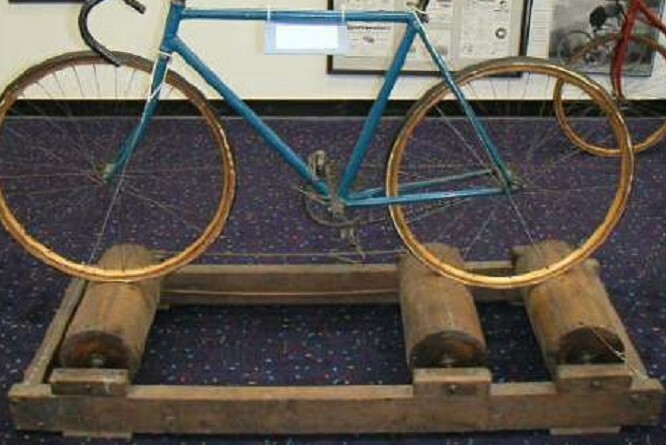 Traditional rollers have been used for over 100 years. They offer lower resistance than turbo trainers. Their light weight and low resistance makes them very popular as a portable warm up option for racers to take to events. The last few years have seen rollers get more challenging with several models of resistance rollers on offer. The comparatively low tech nature of rollers means that they last a very long time, my mid 80’s Tacx rollers are going strong. As well as the actual trainer, there are a few options available to enhance your training experience. The main issues with prolonged use of a trainer are stability, noise, sweat, tyre wear and boredom. Front Wheel supports are essential on a trainer to make the front wheel level with the raised rear wheel. While you could use a book or similar, it will get ruined with sweat. A proper front wheel support will cup your front wheel holding it secure so you can focus on enjoying kicking out the watts. Sweat Covers are another vital accessory to keep your bike parts from the corrosive, potentially ruining drips of sweat. On Demand TV / Films can be a great way to plod through a long steady trainer session. Engrossed in a decent film or TV programme can be a great way to be entertained whilst getting training done. Training Mats are the ideal way to solve several problems. They can deaden noise, reduce vibrations and stop sweat drips from damaging your floor whilst using your trainer. Trainer tyres are made from specially manufactured rubber to grip the trainer roller better and reduce the sound of the trainer in operation. Trainer tyres are for indoor trainer use only. Mix Tape. Well, not so much a mix tape these days, but a folder of ‘pumping bangers’ or whatever they are called today. Hi tempo Belgian techno or loud shouty death metal, whatever’s your thing. It will reduce boredom and cancel out the incessant noise from the trainer! A good quality, decent size fan can dramatically improve your experience on a home trainer. While riding outside the airflow passing over you cools you down. This reduces the amount of sweat which you produce. On the trainer, without the cooling airflow, you are likely to have a constant torrent of sweat cascading down from you, a fan can keep you cool. Also giving an even more realistic riding experience. Photo courtesy of Andrew Dressel. Time for a trainer upgrade? Tagged cycle trainer, cycling training, direct drive, elite, elite muin, fluid trainer, home trainer, I Trainer, Indoor training, mag trainer, motor trainer, rollers, tacx, train indoors, training rollers, turbo trainer, zwift trainer. Bookmark the permalink.